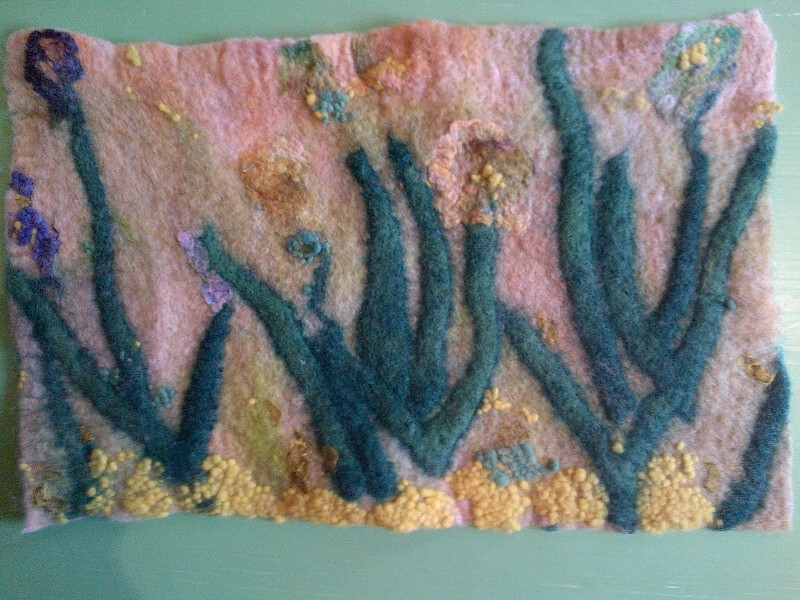 Inspired by pots of spring flowers I decided to make a small piece of pictorial felt. Sometimes when you have some very special materials it is hard to open the packages. I just want to enjoy them as they are. These perfect packages contain some hand-dyed Polworth top and silk hankies from Hedgehog fibres. Aren’t they just so beautiful. I chose some bits and pieces to work with. Making pictures often requires a pre-felt or two to achieve specific shapes so I started by cutting long leaves from a green pre-felt. This top was quite sticky to work with. I enjoyed laying out my picture. 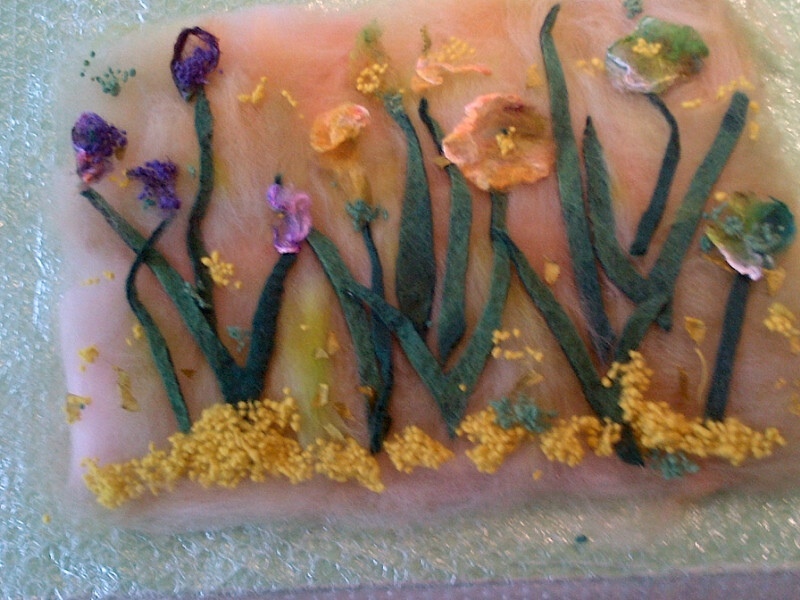 I used dyed neps for texture and made the flower heads from pieces of silk hanky. This made a very soft, slightly fuzzy piece of fabric. It took a lot of work to get the neps to behave. They ended up all over the floor. 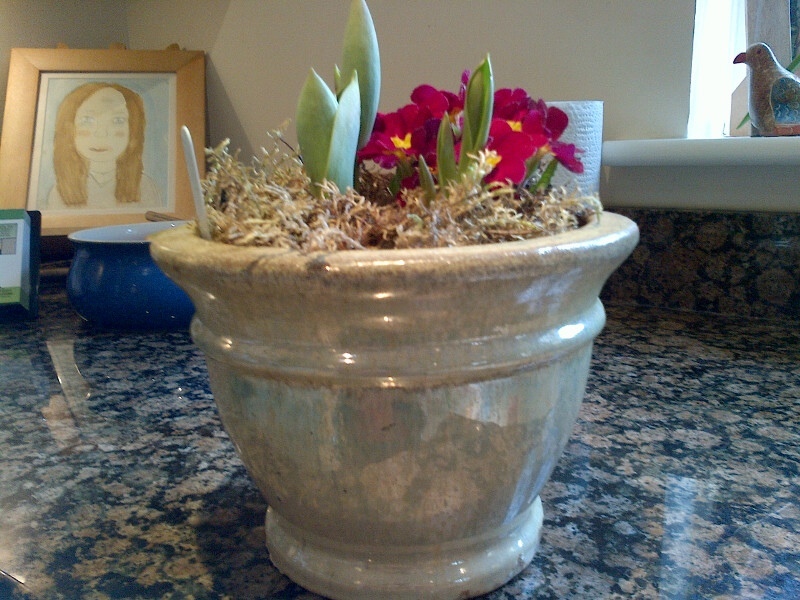 It needed more background and border space and the pre-felt leaves blurred and widened too much as the piece shrank. This difficulty is one of the reasons my pieces are usually abstract, not pictorial. You need to catch the piece at just the right felting stage before the pre-felts bleed too much into the background to keep the shapes. Nevertheless I like the impressionistic quality of the result. The fuzziness is part of its charm. I recognise something there! 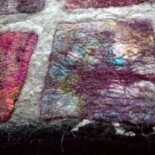 This entry was posted on 22/02/2013 by Themidlandperfumer in arts and crafts, craft, crafts and crafting, creative process, diary, felting, nuno, textiles and tagged decorative felt, felt, flowers, neps, pictorial felt, Polworth top, pre-felt, silk hankies, spring, textiles.